Information on defending impaired driving, DUI, over 80 and refusing to provide a breath sample. Daniel Brown is frequently contacted by the media to provide expert legal commentary. Confused about your criminal charge? We answers your frequently asked questions. Don’t let a criminal charge ruin your life. Information on defending impaired driving, DUI, over 80 and failing to provide a breath sample. Confused about your criminal charge? Check out the FAQs. Few experiences are as scary and potentially life changing as being confronted with a criminal charge. The outcomes for your personal or professional life can be significant. If you are charged with a crime, choosing the right criminal law firm to defend you will be the most important choice you will ever make. At Daniel Brown Law, our criminal lawyers have one overriding goal: to expertly solve your legal problem as quickly and efficiently as possible. Our results speak for themselves. 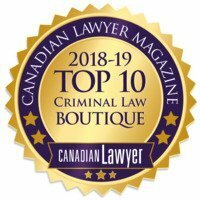 Daniel Brown Law is recognized by Canadian Lawyer Magazine as one of Canada’s top criminal defence firms. While the firm’s clients come from a wide range of occupations and walks of life, many are professionals who find themselves in unfamiliar trouble with the law. In more than a decade, our lawyers have conducted well over a thousand cases. Daniel and his team of trial and appeal lawyers have appeared at all levels of criminal court and acquired the experience, expertise and personal contacts essential to tailoring a defence that fits your unique set of circumstances. Daniel will be there when you need him to work with you one‐on‐one. He also has the advantage of a team of lawyers working alongside him who are well versed in a wide spectrum of criminal law areas. Our mission is to achieve successful results for your criminal case while maintaining the highest level of professionalism and ethical standards. As a criminal law specialist, Daniel Brown is among the most skilled criminal defence attorneys in Toronto. His extensive knowledge and experience in criminal cases has allowed him to successfully defended allegations of murder, impaired driving, sexual assault, domestic assault, fraud, drug trafficking and more. Daniel Brown is well known and respected for his in-depth understanding of Canadian criminal law. As such, he is frequently consulted by local and national media outlets to provide background and opinions on his own cases or cases currently before the courts. The criminal lawyers working at Daniel Brown also possess vast experience in all areas of criminal law including trials and appeals and have successfully defended individuals charged with nearly every type of criminal offence at all levels of court, including the Supreme Court of Canada. Taking complete advantage of the individual skills and talents of our criminal law team, Daniel Brown Law provides legal services to our clients effectively and economically. Our goal is to ensure that you and your matter receive personalized attention. During certain periods of time, Daniel Brown Law may refuse new clients to maintain the firm’s high standards for quality service to their current clients.